Up and Running with IBM Lotus Sametime 8 for the Mac – That Works, Too! I am sure you would all remember how excited I was about making my full transition from my Windows notebook to my recently acquired MacBook Pro with the installation, and successful setup!, from the IBM Lotus Notes 8.5 Beta client for the Mac. So far things have been running pretty smooth and I can certainly confirm that the user experience is just from another world! It simply works! Well, to add further up into the excitement, here I am putting together this blog post where I am sharing what, to me, was the last collaboration tool I needed to have it in my Mac to completely move away from the Windows environment. And never come back! Yes, I am talking about IBM’s Lotus Sametime 8! Up till not so long ago I was actually using Adium to connect to our internal Sametime server(s) and must confess that the user experience was not as good, probably because of how much I have gotten used to other Sametime related real-time collaboration tools, like Notesbuddy, IBM Community Tools and lately Sametime 7.5.1. The cons have been so numerous that all along it felt kind of crippled, blind, numb, so restricted, in short, such a sense of not getting the most out of it all. So when today I had the chance to finally manage to connect my Lotus Sametime 8 to our internal Sametime server(s), I was just ecstatic! And big time!! I am back in business! And enjoying every minute of it with one IM client that expands further and beyond around the concept of Instant Messaging, real-time collaboration and social networking across teams and communities. I am sure that during the course of Lotusphere 2008 you had a chance to get some exposure on the huge buzz around what is happening in this space with Sametime 8. Well, not to worry, as time goes by, I am hoping to be able to blog some more about it so that you folks get a chance to see what I meant when I said, I am back in business!! Can you confirm whether a Mac can host a Sametime online meeting? I mean, can the Mac share it’s screen? I’m using the 8.5 beta Notes client and so far no joy. Hi Wayne! From what I know, if you are referring to the Lotus Sametime Webconferences 7.5.1, you should be able to. I have been able to host e-meetings using Webconferences and using Flock and / or FireFox and have been able to do screen sharing and everything. However, with Lotus Sametime Unyte, the story is different. 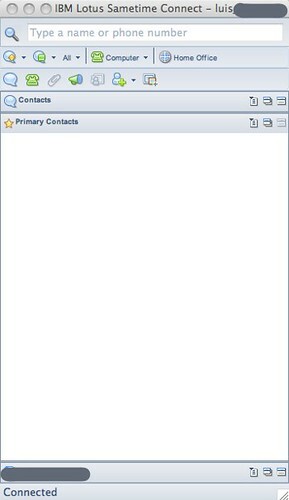 From what I know, you can attend those e-meetings with no problems, but the screen sharing part still doesn’t work with Unyte. It’s been asked and will be adding Mac support in the near future, but right now it is not there. Hope that helps! Let me know if you would need more info and thanks again for the feedback!